This dollhouse plastic air mattress is made from drinking straws and assembled with plastic model cement and a simple heat welding technique. Due to the type of glue used and the heat required, this is not a project suitable for children. The air mattresses can be made from most types of plastic drinking straw. You will need to test your glue and chosen straws to make sure your materials will work for this project (see the information on materials on the next page of these instructions). Simple Heat Welding Technique - While miniaturists and modellers often use hot knives, electrically heated knife blades for cutting and welding plastics, you can experiment with the heat welding technique for plastic using non stick baking parchment paper, a heated iron, a metal spatula, and appropriate plastics. The dollhouse air mattress shown here is a sample of how this simple technique can be used to make miniatures and models. When using this technique please take care not to touch hot surfaces, and to wear protective clothing (oven mitts, eye protection) if necessary. This technique of working with plastic can be used to make a range of miniatures as your skills develop. It allows you to join together many type of plastic which are difficult to glue, including plastic bags and a range of clear flexible plastics. This is not a glue technique, so visible seam lines must be formed in order for the method to work. Disposable Plastic Drinking Straws - You will need enough straws to make a suitable width for a doll in your particular scale. For smaller scales, search for narrow straws or coffee stir sticks, for larger scales, look for giant straws used for iced drinks. The straws should be long enough in scale to make a complete mattress including pillow for your scale of doll. Plastic Model Cement - I used the old standby Testors model cement. If possible use a version with a long thin tube ending for neater application, or make sure you use a fine pin to open the tube. Other less toxic glues may work, depending on the type of straws you use. You will need a glue which is flexible when dry, withstands heat, and dries clear (silicone glues with a fine tip applicator may work, some thick gel type glues for rhinestones and beads may work as well). You don't want to use a glue which melts your plastic, so test the glue on a scrap straw to make sure it adheres, but doesn't destroy the plastic. Non Stick Parchment Baking Paper - or a silicone ironing sheet. This is used to keep the iron and the spatula used for heat welding free of plastic, and to keep melted plastic from ruining your ironing board. Iron (and ironing board) - You will use the iron as the heating element to heat your spatula. Cooking Spatula - or flipper with a heat resistant handle and metal blade. Icing spatula's will work as well. Sharp Scissors - To trim the straws. 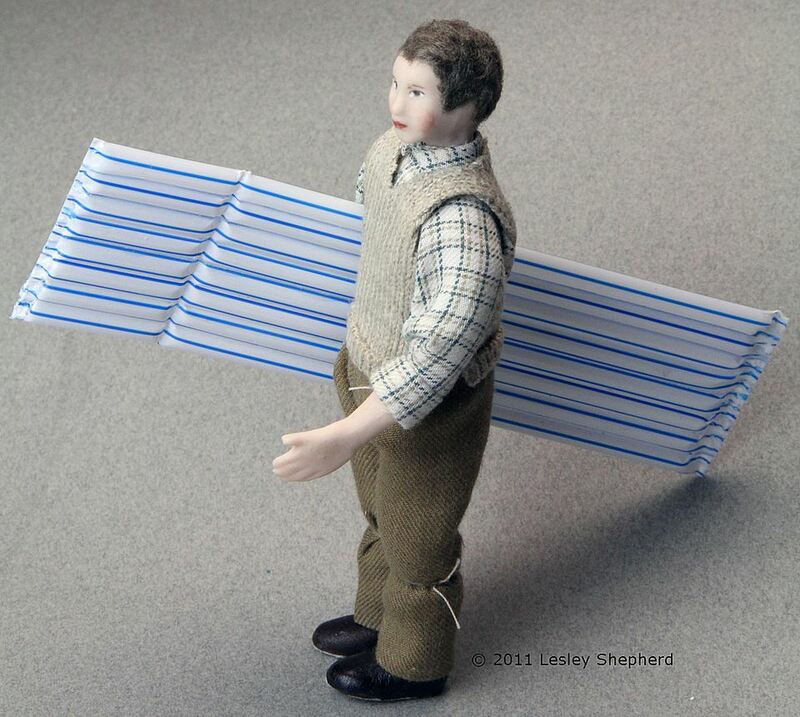 Doll To use to set the size of your scale air mattress. Note: - As you will be working with heat and flammable glues, make sure all glue is thoroughly dry before you apply heat, and work in a well ventilated area. Wear heat protective gloves (oven mitts?) and eye protection to ensure your safety. This project is not suitable for children! To begin assembling the miniature air mattress from your chosen drinking straws, first check that your chosen glue will work with your straws and not destroy the plastic. When you are sure your glue will hold the straws together, determine how many straws you will need to make an air mattress the correct width for a doll. I used eight standard straws for a 1:12 scale mattress. Make sure your straws will be longer than the mattress length you need. It is a good idea to read this entire set of directions and practise gluing a few extra straws and also the heat welding technique before you make your first attempt at a mattress. Work with clean hands on a clean flat dry surface. Plastic model cement can get dirty very quickly and spoil the final effect of your miniature mattress. Begin by Gluing Sets of Two Straws Together - Run a fine bead of glue along one long edge of a straw, making sure the bead is even and has no gaps. If your straws have lines like the ones in the photo, run the glue neatly down one of the lines, to ensure you have a straight line of glue. If your straws are clear or plain without stripes, use a ruler to draw a light line with a pencil down the edge of the straw to mark your glue line. When you have an even fine line of glue running down the side of the straw, lay the straw flat on your work surface with the glue to one side, and press it gently all the way down the side of a second straw, gluing the two straws firmly together along their entire length. Make sure the straws stay flat as you join them together. Remove any excess glue while the glue is still soft. I used the end of a pocket clamp from a pen to clean up the excess glue which oozed from between the straws. Glue all your straws together in sets of two. Leave until the glue dries thoroughly. Glue Your Straw Groups Into Fours - Using the same technique, glue two sets of straws together to form a group of four. Make sure all four straws lie flat and tight together as you glue them. Leave the glue to dry thoroughly. Glue Your Groups of Four Together - Finish assembling the basic width of your air mattress or lilo, by gluing your sets of straws together to make a single flat group. Try to match the ends as closely as possible to make a neat rectangle of straws. Set aside to dry thoroughly. If your iron is too hot, change the settings, let it cool, and try again, further in from the end of your straws. When you get a successful join, let the straws cool. Repeat the same process at the other end of your section of straws, this time, joining them so they make the correct length for your air mattress. Make sure you keep your heat welding with the iron at right angles to your group of straws so the mattress stays a neat rectangle. When you have both ends of your miniature air mattress heat welded together (or glued and tightly clamped flat), use your scissors to trim the ends of the plastic so there is a narrow band of joined straws at both ends of the dollhouse air mattress. If your glue job was done properly, you should have a nice flat miniature air mattress without a pillow section. If your straws separated with the force of the iron breaking the glue lines, use a glue spreader and a small amount of glue to repair any gaps between the straws in the bed of your mattress. Don't panic if your first one or two attempts at a mattress are curled out of shape. Once you get the method of gluing the straws right, so the assembly is flat, and get the temperature of your iron correct, mattresses should be relatively easy to heat weld at the ends. To make your dollhouse miniature air mattress have a heat welded pillow seam, you can use a simple technique to make a neat straight line weld across your plastic straws. Once again, test this on a sacrificial straw or section of a straw to get the technique right before you attempt it on your almost finished air mattress. Your success will vary based on your iron, your spatula, and the thickness of your straws. The trick with the pillow seam is to get a neat straight line of welded plastic, without cutting through the straws. To do this, set your iron upright on your ironing board so you have access to the iron base. Using an oven mitt or heat protection on your hand, and holding onto the heat resistant handle of your metal spatula or 'flipper', press the metal surface of the spatual flat against the bottom of your iron to heat it. Count to twenty slowly, and press the edge of the spatual down on a test straw sandwiched between two layers of non stick parchment baking paper to see if you can weld the side of the straw together along a neat line. If you get a bend, but no weld in the plastic, you need to hold your metal spatual against the hot base of the iron for a longer period, or turn up the heat. If the edge of the spatula melts the sides of your straw together, but separates the straw into two sections, your spatula is too hot, or you are pressing it down too hard or for too long against your straw. When you have worked out the best timing and temperature for welding a straight line across your straws, set your miniature air mattress in between two layers of parchement paper, preferably so the end of the mattress is held tightly to a fold in the parchment paper. (see photo). Use a ruler or some other straight edge to indicate how far back from the end of the mattress you should make the line for your pillow, and apply your heated spatula across the line of the straws as shown in the photo, for the time you have determined should weld the straws together along a line. Allow the weld to cool, and remove the parchment paper. Hopefully you got a nice straight line for the join between the pillow section and the body of the air mattress. If not, try again, adjusting the temperature or the application time. Note: This method of heat welding can be used to join sections of plastic bags together along straight or curved lines. You can heat up curved sections of wire, using them like a branding iron to create curved welds on sections of plastic. Don't heat the plastic so hot that it burns or gives off fumes! Experiment and see if you can use the technique for other projects.